The Most Holy Virgin Mary was born at a time when people had reached such a degree of moral decay that it seemed altogether impossible to restore them. People often said that God must come into the world to restore faith and not permit the ruin of mankind. After the Ascension of the Lord, the Mother of God remained in the care of the Apostle John the Theologian, and during his journeys She lived at the home of his parents, near the Mount of Olives. She was a source of consolation and edification both for the Apostles and for all the believers. Conversing with them, She told them about miraculous events: the Annunciation, the seedless and undefiled Conception of Christ born of Her, about His early childhood, and about His earthly life. Like the Apostles, She helped plant and strengthen the Christian Church by Her presence, Her discourse and Her prayers. On August 12, at Little Gethsemane, at the second hour of the night, the head of the Gethsemane church celebrates Divine Liturgy. With the end of Liturgy, at the fourth hour of the morning, he serves a short Molieben before the resplendent burial shroud, lifts it in his hands and solemnly carries it beyond the church to Gethsemane proper where the holy sepulchre of the Mother of God is situated. All the members of the Russian Spiritual Mission in Jerusalem, with the head of the Mission presiding, participate each year in the procession (called the “Litania”) with the holy burial shroud of the Mother of God..
7. A thread from the cincture of the Most-holy Theotokos. 8. Earth from the Holy Canal circling the St.Seraphim-Diveevo Monastery, along which the Most-holy Theotokos walked. 9. Fragment of the tomb of the Most-holy Theotokos. 10. 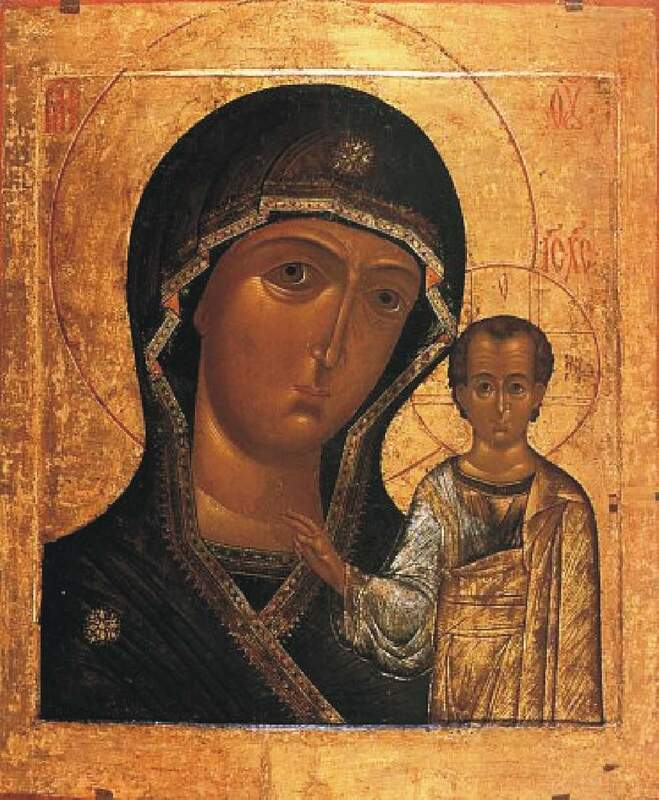 A painted copy of the Iveron Icon of the Mother of God, that used to stream Myrrh. 11. Fragment of the shelf upon which the Mother of God lay in her tomb. 12. Fragment of the maphorion (head covering) of the Most-holy Theotokos. 13. Some of the cotton used in 1947 by Hieromonk (later Archimandrite) Cyprian Pyzhev to clean centuries of soot from the surface of the original Kursk-Root "Sign" Icon of the Mother of God. К Богородице прилежно ныне притецем, / грешнии и смиреннии, и припадем, / в покаянии зовуще из глубины души: / Владычице, помози, на ны милосердовавши, / потщися, погибaем от множества прегрешений, / не отврати Твоя рабы тщи, / Тя бо и едину надежду имамы. Слава, и ныне: Не умолчим никогда, Богородице, / силы Твоя глаголати, недостойнии: / aще бо Ты не бы предстояла молящи, / кто бы нас избaвил от толиких бед; / кто же бы сохранил до ныне свободны; / не отступим, Владычице, от Тебе, / Твоя бо рабы спасaеши присно от всяких лютых. Предстaтельство христиан непостыдное, / ходaтайство ко Творцу непреложное, / не презри грешных молений глaсы, / но предвари, яко Благaя, на помощь нас, верно зовущих Ти; / ускори на молитву, и потщися на умоление, / предстaтельствующи присно, Богородице, чтущих Тя. Иный кондaк, глас тот же: Не имамы иныя помощи, / не имамы иныя надежды, / разве Тебе, Пречистая Дево. / Ты нам помози, / на Тебе надеемся, и Тобою хвaлимся, / Твои бо есмы рабы, да не постыдимся.